Project Manager Michael LaFaive wishes to thank a number of individuals for their contributions to this project. The following names are not listed in any particular order. Gary Wolfram, George Munson professor of political economy, Hillsdale College; Kirk Johnson, Weinberg Fellow in Statistical Welfare Research, Center for Data Analysis; the Heritage Foundation; Jerry Zandstra, director of programs, The Acton Institute for the Study of Religion and Liberty; Ron Utt, Herbert and Joyce Morgan Senior Research Fellow, the Heritage Foundation; Diane Katz, director of Science, Environment & Technology; Paul Kersey, labor research assistant; Daniel Montgomery, graphic arts manager; Jack Mchugh, legislative analyst; Sam Walker, communications specialist; Brian Carpenter, director of leadership development; Elizabeth Cieszlak, administrative assistant; LeAnn Hadley, administrative assistant; Katie Malisow, executive assistant; Joe Lehman, executive vice-president, James Hohman, research assistant; Cecena Lim, Joe Yatouma, Rachel Hoekstra, and Justin Marshall, research interns; and John La Plante and Dave Bardallis; adjunct scholars; Mackinac Center for Public Policy. 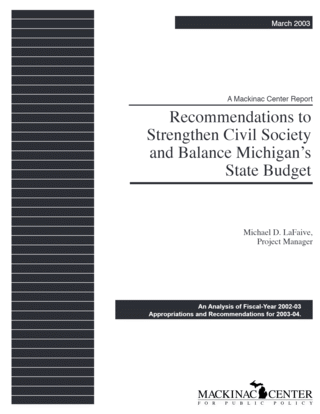 The Project Manager is also deeply indebted to Mackinac Center for Public Policy Senior Vice-President Joe Overton and Aaron Steelman, adjunct scholar, for their April, 1996 study, “Advancing Civil Society: A State Budget to Strengthen Michigan Culture,” from which several sections of this document are inspired. Lastly, the Project Manager wishes to thank the many dedicated, thoughtful state employees who provided him with important data on many occasions. Michael LaFaive is director of fiscal policy for the Mackinac Center for Public Policy.